Chef and activist Michael Romano is one of Chefs Collaborative’s founding members. Our founders were early to recognize the impact of food choices on our health, the vitality of cultures and the integrity of the environment. Growing up with great Italian food and working as a chef in Europe for six years, Michael had no patience with such cavalier attitudes. “The Mediterranean diet and healthy food, the Old Ways organization, that’s what spoke to me,” he says. The work continues. #MeToo has added equality and safety for women and minorities to the equation along with immigration issues and climate change. “We need to be vocal about our beliefs. Show people how it is done. Lend our support to others who are doing this work. Maybe it will rub off on the public. It’s time to show as well as tell,” says Michael. Michael has been honored with James Beard awards for “Who’s Who of Food and Beverage in America” and “Best Chef: New York. ” He’s been named Food & Wine magazine’s “Best New Chef in America,” and under his leadership, Union Square Cafe received the #1 ranking on the Zagat Survey Most Popular list an unprecedented nine times. Michael has co-authored two cookbooks with Danny Meyer, The Union Square Cafe Cookbook and Second Helpings (both HarperCollins). Michael’s newest cookbook is Family Table: Favorite Staff Meals from our Restaurants to your Home (Houghton Mifflin Harcourt, Spring 2013). As Director of Culinary Development for Union Square Hospitality Group, Michael worked with Union Square Cafe, Gramercy Tavern, Blue Smoke, Jazz Standard, Shake Shack, The Modern, Cafe 2 and Terrace 5 at The Museum of Modern Art, Maialino, Untitled at the Whitney Museum of American Art, and North End Grill, as well as Union Square Events and Hospitality Quotient, a learning business. 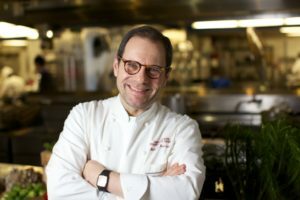 Michael collaborated closely with Union Square Cafe’s Executive Chef Carmen Quagliata and helps select and mentor USHG’s peerless team of award-winning chefs. In addition, he is directly responsible for USHG’s role in Union Square Tokyo.